The right AR15 grip gives you maximum control of your weapon, and the comfort of your grip is key to staying in peak performance in a firefight. But keep in mind that grips available in the market are not built the same and built for the same purpose. Depending on the configuration of your AR15, or its intended purpose, these grips can be very specific to the needs of the user. Here are some things one should consider before buying AR 15 pistol grip. These considerations are not in any particular order and one is not more important than the other and we hope you can choose a grip that works best for you with these ideas in mind. Many grips come in left-handed or right-handed options – these grips will fit your hand precisely, but they are specific to the orientation you choose. You can also go with an ambidextrous grip – these will work with either orientation, but again, a left-handed or right-handed grip will fit your hand more closely. An example of an ambidextrous grip is the Ergo 2 AR15/AR10 Ambidextrous Pistol Grip. Lefty or righty – it’s all good. An AR15 grip can be made of various materials or a combination of materials. Considerations of weight, durability, and comfort are just some of things that come to mind and with these materials everyone will have a different feel and comfort level. The “standard” A2 AR grip is a polymer grip – many people prefer a rubber-coated grip for a little more substance. A polymer example is the Troy Enhanced Battle Ax CQB Pistol Grip for AR-15. It is strong and built for CQB action. For a superior grip, a pistol grip with finger grooves and contours is more comfortable and gets in contact with more of your hand to ensure a firmer hold. For the most part, these grips are one-size-fits-all and will work with any hand. The Hogue AR-15 Overmolded Pistol Grip with Finger Grooves in mind when picking the one for you. If you wan to maximize the usefulness of your grip – consider using it for extra storage space. In the field, you might need tools, batteries for your optics, or any other item that might be squeezed in. The Hogue AR-15 Pistol Grip w/Samson Field Survival Kit is a cool grip and storage item rolled into one. For long range shooters, working with a weapon equipped with a bipod and a palm shelf assists in keeping steady trigger control and relaxes the grip for better shots that land on target. The added weight serves as a damper for recoil and resetting for another shot is easier. The Ergo Deluxe Tactical Pistol Grip w/ Palm Shelf is made for the AR-15 or AR-10/.308 and it might work for your sniper setup. You want a purpose-specific setup with added comfort and above all, a solid grip. 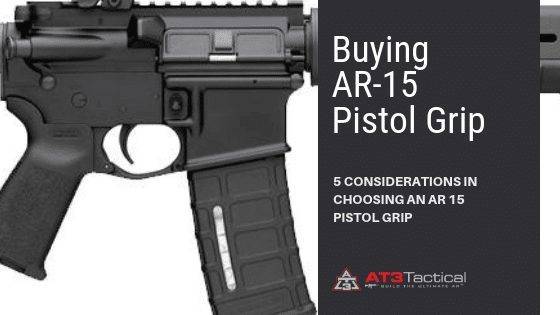 There are many of them out there to choose from but do your homework and get the right one and best fit AR15 grip for you. Very interesting… a lot of nuggets of information that I had not considered before. The HOGUE Samson Field Survival Kit grip really has my attention. I do have a G30 sf. I want the laser grip. So your saying that there is no way it will work with the sf, or you pelosnalry modified the ones you have to work with the sf? ?Cell number is 267 265 0743 if thats easier for you. text or call whichever.Thanks, Derrick. I use skateboard grip take to cut out shapes and apply them for better traction/grip to clutch areas on my firearms. Works VERY GOOD.